Does that engine have TVC? The simplest solution is just cant it through the vehicle's (including the payload) center of mass. Most LV solids do that. Since I dont know enough about it, i"ll just take space ghosts word for it. He's right that you don't need a controlled system to vector the thrust through the CM, just a fixed angle that intersects it. In any case where the thrust vector is offset from center, cosine losses, RCS offset thrust, and GNC that can cope with thrust asymmetry are required. The cost of using TVC is complexity/reliability, the benefit can be lower total prop usage (less RCS offset thrust, shorter maneuvers) due to its greater control authority. And there are things you can do with it you can't any other way. Space Ghost, don't forget with no "air resistance" in space a single offset engine canted through the center of mass has no cosine losses. You only have loses when you cant more than one engine or are trying to fly through atmosphere with canted engine(s). Getting back to TVC, did the AJ-10 on the Shuttle use TVC, or rely on RCS for fine tuning? Sure where drag occurs. 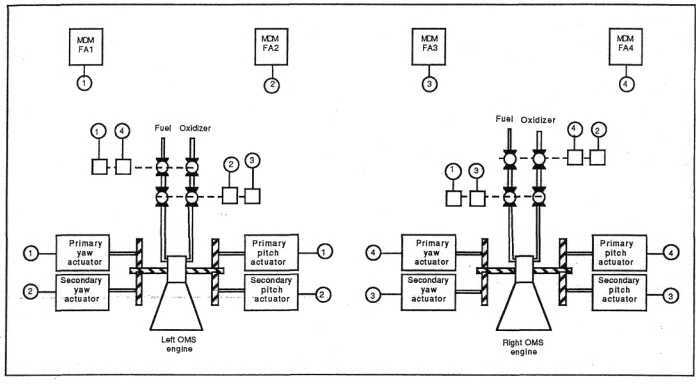 But if you have a fixed angle offset engine, attitude control before/through/after the burn is maintained by RCS (or CMG) solely. If the guidance for the burn is inexact, say to slight CM shift (prop/consumable depletion etc), then cosine terms come into play, as you "waste" part of RCS/engine burn cancelling the error. That was what I was referring to. OMS engines are gimballed. FRCs/ARCs for adjusting vector so as not to exceed gimbal rate/limits. I can go through the entire OMS thrusting maneuver control sequence (attitude hold, ...) and decisions. Variable forward/aft depletion on Shuttle RCS was a big deal, you could have surprises on mission/mission planning often as a result.